Getting past the gatekeepers to talk with decision makers can be one of the most challenging aspects of sales. The more important your decision maker, the more likely it is that they have one or more levels of gatekeepers – administrative assistants, direct reports, etc. – to keep people from reaching them by phone. We interviewed a professional call screener (whose name will remain anonymous to protect his/her identity) to get the inside story on how sales people can avoid getting weeded out by some of the familiar call screening traps – and what it takes to really get through to decision makers. A. As a call screener, my job is to protect the time of the decision maker that I work for – so I need to make sure I’m not passing through calls that are going to waste our executive’s time. Lots of sales people make it really obvious that they are calling on a sales call – for example, sales people might say, “May I speak to the person in charge of purchasing” or “Who is your current vendor/supplier for (such-and-such) product or system?” When people say this, I immediately know that it’s a sales call, and I put my guard up – because I know they probably don’t have a relationship with our executive and they’re just trying to get through. It’s amazing how many sales people call that really don’t know anything about our company or don’t know the names of the people who work here. It’s like they just got our number off of a calling list. Q. What do you do when you suspect that a call is a sales call? A. I always say, “Is this a sales call? What are you selling?” The good sales people usually come clean and tell me what type of product or system they sell – there’s no point in trying to deny that they are, in fact, making sales calls. Sometimes I’ll ask them for more information, or I’ll ask them to send me a brochure. At this point, I’m not going to tell them the name of the decision maker, because my job is to keep the decision maker from getting calls like these. Q. Do sales people ever just, well…lie to you? In an attempt to get through to your boss? A. Yes! All the time. Unfortunately! Lots of sales people will use some kind of line on me, like, “I’m returning your boss’s call,” or “I’m a friend of your boss.” This always makes me suspicious. 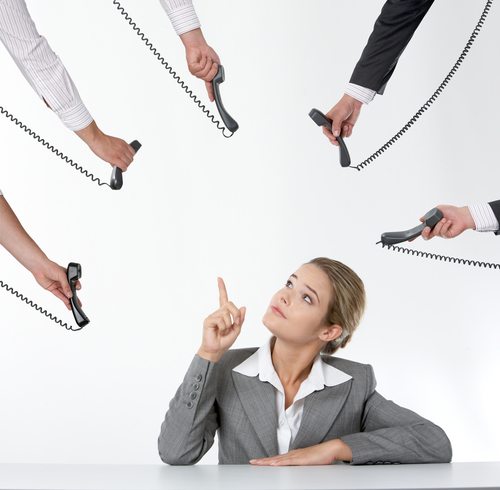 Because usually, I know who the boss is calling, and I’m usually familiar with the boss’s inner circle of friends who would be calling during a work day. Whenever someone tries one of these lines on me, I know they’re probably a sales person. So I ask them for their name and number, write down the information and double check with my boss before I connect them. Q. What happens if a sales person lies to you? A. If I find out that a sales person was lying to me, I’m not going to be very helpful in connecting them to my boss in the future. We need to do business with people we trust. Starting off your first contact with me with a lie is not good business. Q. What is the “right way” for a sales person to approach you, in a way that will make you want to help connect them with the decision maker? A. The best sales people treat me with respect and try to get to know me and act with courtesy and professionalism. They don’t lie and they don’t try to hide things from me – they are happy to talk about what they do and volunteer information and details about what they’re trying to talk with us about. Just because it’s my job to be the “gatekeeper” doesn’t mean I’m always going to keep the gate shut! If you can show me what kind of value you can offer, and show me how your product or service can help make my boss’s life better, I’ll do what I can to help make sure your information or phone number or whatever gets in front of my boss. Editor’s Note: As an additional bit of advice, we also suggest – try to build relationships with decision makers that are not dependent on gatekeepers. Use your network. Go on LinkedIn and start working your network from a few degrees of separation out, and try to ask for introductions so you can get closer to the decision maker. Find out which people you might already know inside the prospect’s company. Build alliances with people at the company to get introduced to the right people and “work your way up” to reaching the decision maker. If your only chance to talk to a decision maker is to try to talk your way past a gatekeeper, then your chances are slim. But if you can work your way toward the decision maker, by using your relationship building skills and your existing network of contacts, you’ll be more likely to make the sale.